I can’t believe I haven’t written a blog in quite a while, when I checked I was shocked. The good news is I have been too busy to sit down and concentrate to write a blog and the bad news is I have been too busy to concentrate. There has been so much new and so many updating it seems I am always playing “catch up”. It was a very busy fall and Trollbeads Fest was another great event with many happy return visits and a lot of happy new comers. We are busy planning the 2018 Trollbeads Fest and it will be in the first weekend of October. So make your plans now! As far as what’s new since my last blog I could spend hours rehashing all the releases since the last blog but I think we all know what they have been. One very special bracelet kit release was the “Wishful Sky” bracelet and it is still available for only $109.00. It comes complete with a chain, a star lock, a silver star bead and the most beautiful faceted blue glass bead. The depth of tone in the glass bead is so rich and eye catching. The Christmas Glitter kits were remarkably popular because they are beads you can wear all year long and are primarily glitter! If you count the kits I have sold in my gallery and on the site I have gone through over 150 kits. That, by a long shot, outsells all the other past Christmas Kits. A sample of the glitter kits is shown below. It’s not only the craftsmanship of the beads that make these kits sensational – it is also the variety and the overall neutral nature of each bead. My most sincere hope is that the artisan group responsible for making these beads is now creating a new batch of unique beads. I have purchased more of these beautiful kits so I can keep offering them to you. Speaking of unique beads…have you seen the “Unique Beads” Book that came out in the fall? 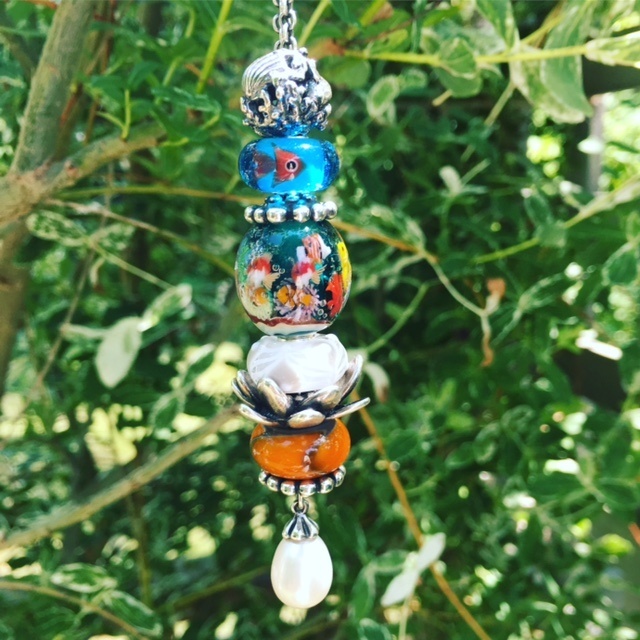 It is a remarkably beautiful book telling the story of the path to humanitarianism the Trollbeads family have taken to create their bead studios in places in the world that need work. It is a colorful hard bound book showing you the beautiful faces and environment of the artisans from Tibet and the other studios. If you are a serious Trollbeads collector it is a must have. We can only ship within the U.S. at the price it is at. Email us for postage quotes outside the U.S. In addition to the Glitter Christmas Bead Kits, the Winter Christmas Kit was a good seller as well giving you all the wonderfully colorful tones of the Christmas season. This is another Christmas kit that we all think out ranks the older kits. Of course the critter outsold the other beads so we had to change to selling them in trios. Each bead is a good additon to your collection so take a close look before they are gone. All 6 beads are beautiful! Along with the two kits I have mentioned the animal spacers from this release were great. They added the Generous Piglet and the Grateful Turkey Spacers to the Fox Spacer they had released in the fall. If you have had a chance to see them click on the links and do so now! As far a bead categories go I am so happy to see the addition of the Spacer collection and love seeing all the new versions being added. The 2018 Valentine bead is the Rose spacer and it is gorgeous and wonderfully textural. The most recent collection released is the 2018 Spring “Enchanted Forest” Collection. With the Peacock being the major theme it has made many collectors happy. From the unique Peacock Feathers bead to the critter Peacock unique beads Trollbeads collectors have always shown their love of the peacock and Trollbeads was listening. 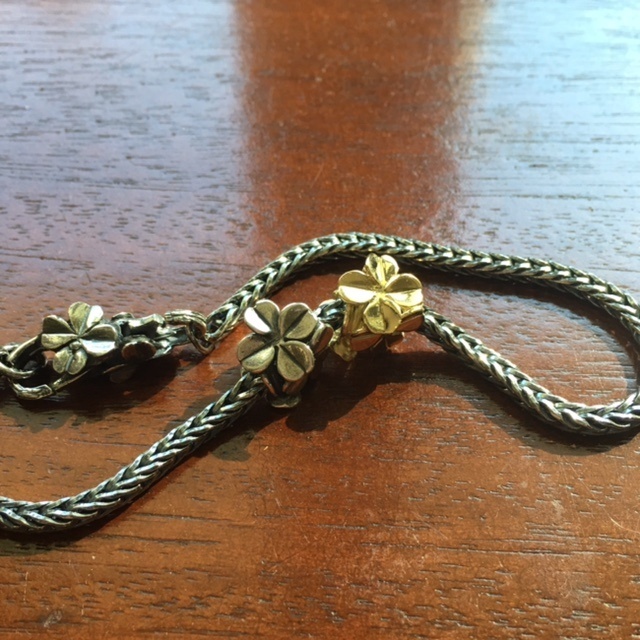 The Blooming Katniss Pendant (shown above) is stunning but also has so many versatile ways to be used. See it on a Fantasy Necklace below. There are two glass kits that have so much variety yet can be worked together to make wonderful creations. You need to look at all the beads to appreciate the entire collection but we all have favorites. The Enchanted Peacock Pendant is dramatic and beautifully etched and can be worn on the newest edition of the Fantasy Necklace Collection, the Peacock Pearl! This newest edition to the Fantasy Necklace group was an introduction to the new pricing of this group. From now forward all the Fantasy Necklaces will be priced the same in every size. 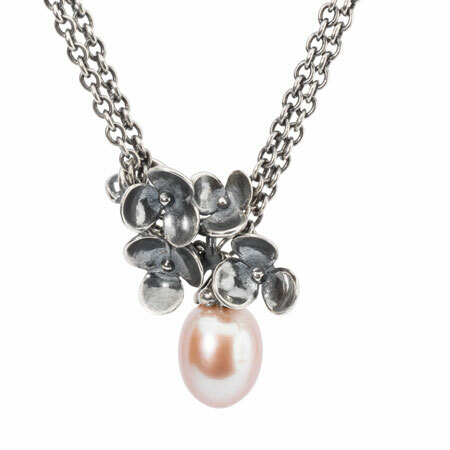 FOr an example the White, Pink and Peacock Pearl Fantasy Necklaces are now all $145. Speaking of pricing changes recently there have been subtle changes to make the Trollbeads prices the same the world around. You will notice tiny changes in some of the glass and stones and some of the silver which has gone down. The changes are both up and down but the majority of the decreases is in the Gold Beads. Besides the standard releases there have been great improvements to the Jumbo Unique beads with a great variety of beads. To see some of the newest released kits click here: Jumbo Beads. They are fun to work with on all Trollbeads carriers but I prefer necklaces and mostly Fantasy Necklaces and of course Bangles! Below is a Jumbo bead on a chain necklace with beads from the 2018 Spring release! The 2018 Retirement is the biggest news. As far as retirements go, historically this is a huge one! We are very sad to see so many of the older beads but we know for the new beads to continue and offer us wide varieties we must say goodbye to older beads. Take this link over to the 2018 Retired Beads so you can see what is on it. On my Trollbeads Gallery Forum we have a discussion going about the release and the beads many of us will miss the silver classics such as Harmony, Transformation, Ice Bear, Indian Elephant and Jugend just to name a few. The silver/gold Happy Universe is one of my all time favorites and that has been retired. The glass beads in the group are plentiful and varied. All time favorites of many are the Azure Bubbles, Milan, Florence, Khaki Stripe and the Mixed -Green Armadillo. 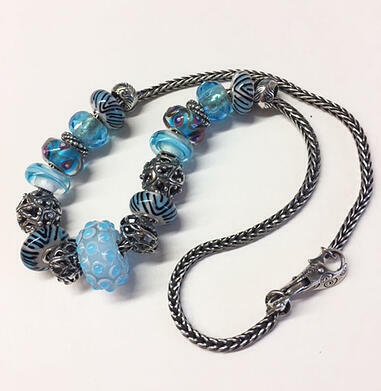 There has been much discussed as far as the inventory Trollbeads has in these beads as it seems they have been shedding their inventory even before the announcement and there are some beads no longer available for retailers to order. As a dealer I have always ordered heavy and quickly when it comes to any retirement but my advice to all is the purchase the beads you’ve had on your wish list before they are gone. Below are Horses, Jugend and Indian Elephant! Link to the 2018 Retired Beads. If you are on Instagram please look up TrollbeadsGallery and follow us. You will see great inspiring photos and when good unique beads come in I try to take a shot before I list them. Thank you for reading and I hope to be writing more often. It's one of my New Year resolutions! On October 6 & 7 Trollbeads Gallery will be hosting our 8th Trollbeads Fest! Our first Fest was a historic event as it was the first of it's kind of Trollbeads celebration and now we are holding our 8th one! Below is condensed information to help you learn about it! If you love Trollbeads you'll want to be here! 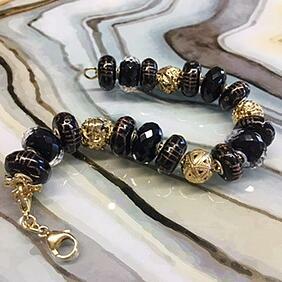 We always have an outstanding Event bead and this year's bead is the Black Longevity Bead shown above. We will also have over 100 Unique Armadillos and hundreds of Fresh Unique beads and a few beautiful butterfly beads! Trollbeads is also providing 4 new Event beads that will ONLY be available during events and I can tell you that two are beautiful stone beads! So call your Trollbeads buddies and make your plans for a fun weekend! 4:00 -6:00: Wine and Charity Bead Auction. Auction items listed below. 10:00 - 5:00 We will have a glass artists making glass beads! Have a seat and watch the remarkable process unfold. 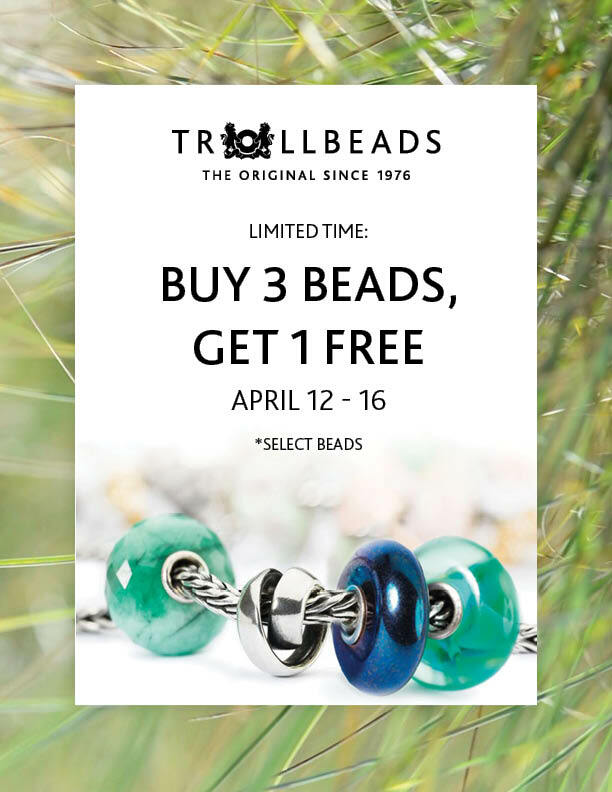 Buy 3 Get 1 Free to help you make the most of your Trollbeads dollar! We will have hundreds of unique Trollbeads to offer you and I am already saving the great uniques to have for you! We will also be offering a free $46 chain with a purchase of any upgraded clasp! We will also be offering two free silver stoppers with a purchase of any silver or gold bangle. We will also offer you 25% Off all Fantasy Necklaces. Amber Bead With A Bug! There is no entrance fee for this event but you will be getting a gift from us as a token of appreciation. If you need hotel suggestions click on this link and see the area's hospitality suggestions! If you are coming from a distance it may help to know we are 1 hour from Boston, 45 minutes from Providence and 30 minutes from Cape Cod! There is so much to do and see in New England in the Fall! We hope to see you! Here is the reservation info for the hotel in Fairhaven, the town next to Mattapoisett. Hampton Inn has agreed to hold a block of rooms at $149.00 +tax for a standard room with 2 double beds or 1 king bed. These rooms will be held until September 5, 2017. Guests may reserve by calling the hotel directly and referring to the Rogers Gallery / Troll Beads Block, online at www.newbedfordfairhaven.hamptoninn.com , or by calling 1-800-HAMPTON and referring to Group/Convention code RGT. Trollbeads Updates for Early Summer 2017! There are so many things to bring you up to date on a variety of sale events and new release events coming up with Trollbeads this Summer. Our exciting season began on Saturday when we all celebrated Trollbeads Day with the release of the beautifully organic Trollbeads Day Bead, the Golden Rutilated Quartz, a precious stone with Rutile inside. The Rutile within the bead are like golden needles and make each bead unique. Trollbeads Gallery is selling these beads in our "Trollbeads With A Twist" category so you can see the bead before you buy it! We have just received a new batch of them and we are listing them constantly! Don't miss out on this stunning and very limited bead. The beauty of stone beads is that each one is totally unique. Sometimes one is not enough! Our July 4th Unique Beads Category is now live! This is the 9th year we have listed these special uniques beads for your July 4th jewelry. Check them out quickly as they are going fast! It is a favorite time of year for me and for many of us who get to share time with our family and friends to celebrate July 4th and these beads will help you do just this! July 4th Unique Beads. Today, June 23rd we have listed the Summer Trollbeads release, a small but mighty little release. It is all about the butterflies! Dancing Butterfly Spacers, Dancing Butterfly Studs and Butterfly Earring Components. Shipping will commence on June 30th. See photo above! The Dancing Butterfly Spacers will add a whole new lease on life to your favorite Trollbeads! Sale Notice: June 28- July 5 We will be having a Summer Sale Event. There will be a total of about 30-35 beads which will be on sale for 25%. We will be adding all of them to the sale as the week goes on! A progressive bead sale, sort of! Along with this sale we will also be offering the very popular "Free Silver Bracelet Chain with the Purchase of an upgraded Clasp" event! Sale Notice: On June 30-July 7 We will be having another favorite sale event! The Buy 3 Unique Beads & Get 1 Free! As usual we will be listing as many unique beads as we can so you will have a lot to choose from! 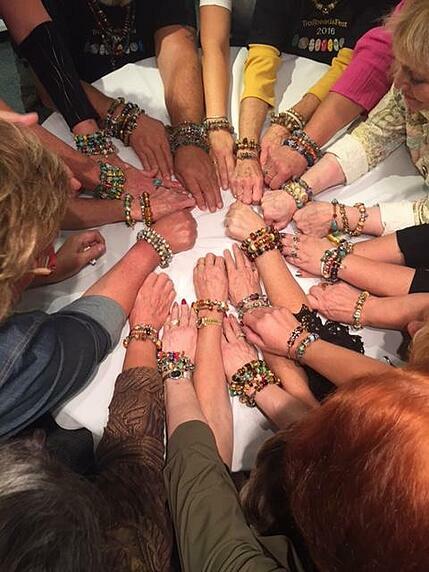 Announcing the "Bracelet Helper" has now reached the U.S.! Beginning on July 1st you can receive one of these great wooden bracelet helpers with any order over $75.00. Buy 3 Trollbeads & Get 1 Free Is Here!!! I know many of you are already making your shopping list! This particular sale is a great time to add bead to your collection that you have had on your wish list and save money at the same time! We have seen a lot of new collectors join our ranks recently (which we are very excited about!) and I thought I would write this blog to help newbies better understand the best way to take advantage of this sale. The first thing to know is that it only comes around once or twice a year so take advantage of it! The second thing is to gain a good concept of how to group your beads in such a way that you save as much as you can! Create a group based on the same price and your free bead can be that price too. In other words if you are buying a $63.00 bead, a $46.00 bead and a $31.00 bead you can only get a free $31.00 bead. If you create a group of three beads at $63.00 your free bead can be a $63.00 bead. It obviously means the more you spend the more you save but that’s the way it usually is! So if you have your heart set on a couple of the $31.00 beads it is best to have them all be $31.00 but it really doesn’t matter to us. 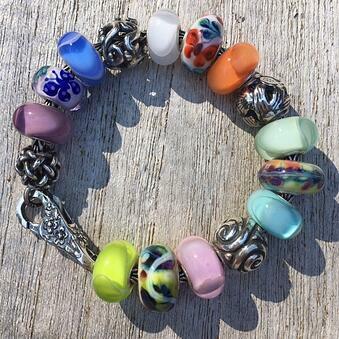 Items not included in the sale are all Limited Edition Beads such as the new Mother’s Day Beads. Also excluded is the New Spring Collection. On Trollbeads Gallery all you have to do is to buy your 3 beads and at check out write your free bead in the notes section! Very easy! Again please call us if you have any questions. Trollbeads New Kindred Spirit Collection! As one of the leaders in spreading the Trollbeads news I have to admit I have been very lax in writing enough blogs. This is my first blog of 2017 and while understanding this I have to think why I can’t get to it more often! Then I think of my days and the time I spend processing and listing unique beads has gradually grown through the years and as of today I must admit that probably 75% of my time is spent working on unique beads for my website. I’m definitely not complaining as I am thrilled the Trollbeads unique beads are so popular. Even when I go on vacation I shoot the photos before I go and leave the beads for Penni (our shipping manager) and gradually process and list them while I am away. My family thinks I need an intervention but I enjoy it so I do it! If you haven’t recently seen my unique offerings and how often they change take a look now at: Trollbeads Gallery Unique Beads. I’m sure if you are reading this blog you undoubtedly have seen the great new 2017 Spring Trollbeads Release “Kindred Spirits. 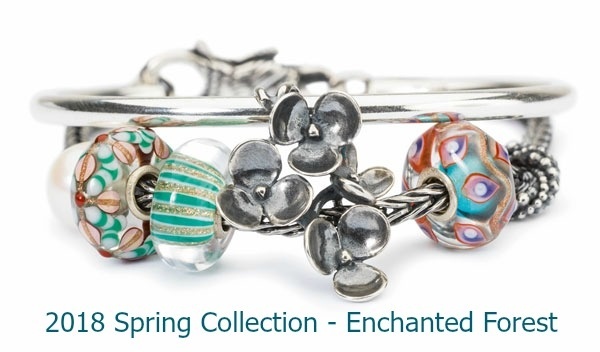 The collection is online now on Trollbeads Gallery and is quite wonderful. Trollbeads original and premier silver bead designer, Søren Nielsen has created a majority of the new beads and I am one of his biggest fans. Check out Hourglass, Bumpy Ride, Rhythm Drum and Moonlight Dancing. They are all classic Trollbeads and classic Soren in design with outstanding details. On the other hand we all know Soren has another side to his design personality and this is supported by his Troll and Fairy designs in this collection. Each Fairy and Troll looks like they all just climbed out of an enchanted forest and it’s this appeal that speaks to our inner child and what makes us love Trollbeads. Soren’s designs are fresh yet stay in line with what Trollbeads has been and should be! Another long time designer for Trollbeads, Mette Saabye, has created the new Water Lily Lock, the Water Lily Family, the Water Lily Spacer and the Single Water Lily Spacer. Mette is a very active and diverse artist in Copenhagen and her talent is in all mediums. One of her most popular beads is the Endless bead. It has been in the line for many years. I was fortunate to meet Mette when I was in Denmark and so enjoyed seeing her studio and gallery. Look at her exquisite Water Lily Spacer Bead below on the bangle. Designed as a Spacer it can sit on your bangle or Neck Bangle and not move and not need stoppers! The new glass"Enchanted Days" kit will literally leave you enchanted for days! It is a great kit in its entirety! It is important to remember when you purchase any kit of 6 beads you receive 1 bead free! The glass kit was designs by a lovely trio of artists Tashi, Dhundup and Dolma. 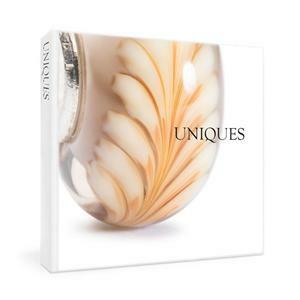 Tashi, Dhundup and Dolma are the designers of the 2014 Summer Limited edition glass beads. They have all created beautiful beads for the Trollbeads Collection since 2004. Originally from Tibet, but now living in Dhramsala , the home of their spiritual leader Dalai Lama. Many Tibetan artists have been given the chance to create beads and support themselves while living in Diaspora with the humanitarian efforts of Lise Aagaard. This is just one of the many reasons why I love the Trollbeads brand. Below are the 3 enchanted designers! The glass bead “Prefect Moments” is a perfect mate to the bead I asked to have made for my Trollbeads Fest 2016. I have never seen a bead so successful! I am so pleased they have released this beautiful bead to accompany the Fest bead! It is the bead at the top of the blog! 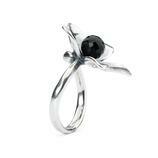 There are two new Trollbeads rings in this collection too! The Venus Flower Ring (below left) designed by Søren Nielsen incorporates a Black Onyx stone and the Twisted Ring Of Change by Kim Buck. The ring in the center is what you will get and the ring on the right is a suggestion of how you can use your beads on the ring. It works exactly like the original Ring Of Change. You have so many rings as it is your imagination and your collection that can offer you a world of rings! I would like to finish up this blog with a request for you to follow me on Instagram. If you don't have Instagram yet just download it on your phone! It is that simple. I always strive to add at least one or two new photos everyday and you never know when a great bead (one you've been wishing for) shows up! If it does just email me and ask for it! Just go to Instagram and search for Trollbeads Gallery and you can look at some of the great photos of Trollbeads I have added. :-) Thank you for your follow! Trollbeads & Trollbeads Gallery December Blog! Happy Holidays From Trollbeads Gallery! We have kicked off the Holiday Shopping Season with a bang! Our Black Friday Sale is on and running until Monday, November 28th. We have sold out of a few retired beads but we still have a lot on offer to make your Christmas cheerful and bright! If you haven’t checked out the beads included in the sale you can do so by clicking on this link! Trollbeads Gallery Sale We have up to 50% savings on over 70 beads and two locks! It has been one of most successful sales to date! Our Christmas Unique Trollbeads are wonderful this year and I have been very busy trying to keep the inventory fresh and filled! I add new beads everyday so check this page out too! I am very proud to say that this is our 10th year of providing this colorful category of beads that I hoard the year through just to offer them to you at this time of year! Some of these beads can also be a part of an older holiday kit that we have broken up to sell as separates. Speaking of Holiday Kits, we are now offering the Winter Wonder kit in separate bead form. I photograph each bead so if one is sold out just check back and I will have another one soon! It is a beautiful kit with all glitter beads! I have them listed with the 2016 Winter Collection and with the “Trollbeads With A Twist” beads. As many of you know Trollbeads has had a serious problem with the smaller retailers dropping the line in the last few years and it has been a sad thing for many collectors finding themselves with no local source. I have written about this in emails but have not discussed this in my blog. I am so happy to say that the trend is reversing itself and new stores are being opened again! I believe this will be further helped by the fact that Pandora has recently been reported to have closed 450 small dealers in hopes that some of these dealers will step up and open a Pandora concept store but there have been many closures. I know of one store that signed up with Trollbeads and on the first day of selling converted 115 Pandora collectors to Trollbeads collectors. If you have Pandora and don’t know about Trollbeads you are happy but once you see the difference in the quality and in the craftsmanship there is no comparison. Trollbeads hands down. There is a change that has been in the works both here and in Denmark. The founder of Trollbeads, Lise Aagaard and her husband Peter are once again in full control. They had stepped down as the CEO’s but after much thought have taken over the reins to guide the company back to the DNA that made Trollbeads what it is. They have appointed their son Robin Aagaard the CEO of the Trollbeads U.S. to help bring back to the U.S. the service and the guidance that made Trollbeads the brand we all know and love. I can tell you after 10 years as a dealer I can’t be happier with the changes. The above photo shows Lise at Trollbeads Fest 2016 signing autograph cards for our happy Fest attendees, Sharon and Trudy. Peter and Lise came to our Trollbeads Fest in October and Lise gave a great informative talk on how they have helped countries in the third world and people who need employment by building studios and training them how to make beads. They have a few very successful on-going self-supportive workshops including the original one in India with the displaced Tibetans that have been creating the unique beads for years for them. The positive difference they have made in the world is huge and I am so proud to be a part of this success. Lise explained that her decision to do this came from a line she had read. “If you want to make a positive change in the world take what you do well and teach it to those in need how to do it.” I can tell you she has made a very positive change for many people. They showed us videos of the workshops and it was very enlightening. At this point I want to thank all of my loyal customers for continuing to support our business. Like every small business it takes great product and great service but we know that is available elsewhere so we just want to say a huge thank you. It is particularly difficult when you are in competition with your supplier. Trollbeads is a huge company compared to us so it is daunting for us to see the volume of ads they pay for on Google where we cannot do this. While I love the company for so many reasons it also pains me as a retailer to compete with such a large professional company with professional ads and multiple ads. I know a lot of manufacturers are tending to open retail websites but it is still a hard thing for us to work with. 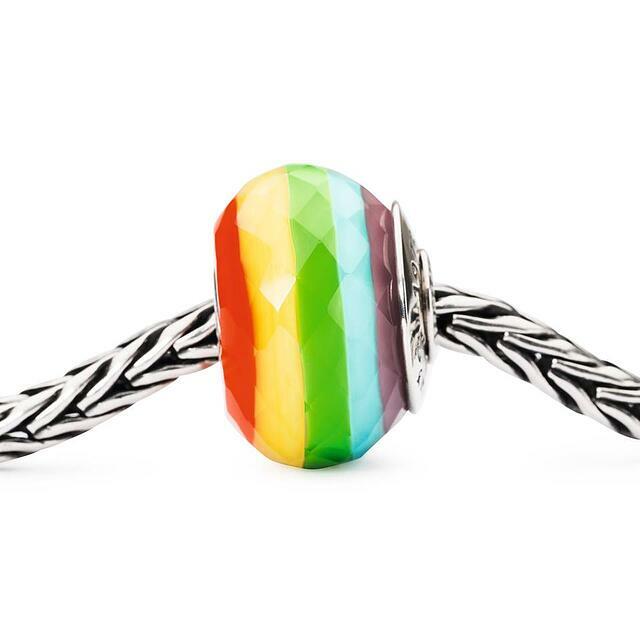 So once again thank you for your continued support from a very grateful small business owner and thank you from Penni, Carole and Ruth who love helping you with Trollbeads! The 2016 Winter Collection & The Fest Longevity Bead! The NEW 2016 Winter Collection is here and it is the best yet! The Winter Wonderland Kit is the ultimate glitter kit. All 6 beads are incredible and all must haves! I have shown the kit to many collectors and they are all very excited about its potential! Of course the other Holiday Kit, the Wishes and Kisses Kit, has more traditional holiday colors and will add color to your 2016 Holiday designs. The most exciting addition for me is the new silver Neck Bangle. We have been playing with it and love all the possibilities. It is comfortable to wear and fun to design. With the new spacers and with the stunning additional spacers added in this collection the design capacity is endless! The new series of Zodiac Stars are a great next generation of the retired Stars. New stones and a new design with a dotted design around the points of the star design. They are shown above on the top Neck Bangle photograph. The New Star beads have their own category as a sub category to the New Winter Collection. The Magic Bow Bead is actually a pendant you can wear on your Fantasy Necklaces. The Double Bow bead is a fun way to connect your Trollbeads chain bracelet to your Trollbeads Bangle bracelet! As shown below! The only new animal themed Trollbead is the Love Goat which is a funky goat with a heart face! It’s amusing in its own goat like way! This collection sees two new 18K Gold Beads added to the Trollbeads Collection. Both the Nodes of Joy and Family Love are only available in gold and are great designs. The past few months have been filled with us trying to keep track of people wanting the Fest Longevity Bead and trying to send Paypal Invoices as we couldn’t just list it on the site. We have NEVER had a more labor intensive bead ever and have now put all the remaining inventory on our website so you can have access to it directly. We have never had such a demand on a bead! BUT, in order to qualify for a bead you must spend $150.00. If you spend $300 you can buy 2 and so on. How do you quality? It is no longer available to purchase alone. We have eliminated the original $6.00 processing fee, so the bead is again only $34.00. Once your cart totals $150.00 you will be given a link to purchase the event bead. The ease of it is somewhat hampered by our website’s limitations. If you order more than one only having spent $150 the money will be refunded to you and you will get one! Happy Shopping!! Autumn Trollbeads and Our Autumn Fest Is Approaching! Everyone here at Trollbeads Gallery and Rogers Gallery has been very busy preparing for a very busy Autumn. From the new Autumn Trollbeads “Spirit of Life” Collection, the release of the 2016 People’s Bead “Celebrate Life” to the many faceted plans of Trollbeads Fest! 2016 on Oct 7 & 8...it has been non- stop action! The new “Spirit of Life” Collection release has given us surprises and beauty in its beads. I am happy to say that the beads have been selling well across the collection. In the silver beads it is no surprise that the Mexican Sugar Skull has been the best seller seconded by Vision of Light that has such fine beads of silver on the edge. I also like the price at $31.00. Chihuahua is a cute bead for those who love small dogs! The new glass beads from the Collection have been well received across the board with a definite popularity on the three Nature Beads with the design that hearkens back to the old Python design. The “Soul of Flowers” has been more popular than I thought it would be and it seems to go in multiples. I have added a few of the glass beads to “Trollbeads With A Twist” so you can see each individual bead before you buy it! The two new stone beads are great additions to what is now a large family of faceted stones Trollbeads has. 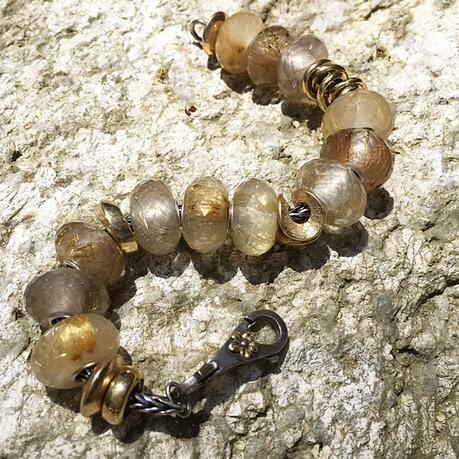 The Calcite Rock has a very earthy look to it with brown being the predominant color with greens and golds and like most of the stone beads each one is very unique. The second stone bead is the “Feldspar Azurite Rock” bead which has two colors, a deep aqua and Grey. The difference in each bead is how the colors are balanced. Once again we have added these two stone beads to the“Trollbeads With A Twist”category. The newCaroline Jessamine Lock is a very sculptural lock and if you love flowers this lock is for you! All four sides has a flower which means there isn’t a dull side. It’s easy to use as you just hold on the flowers and work it from there! There are two new Tassel beads where each stone ball is faceted. One is shown above. One is a Citrine Facet Tasseland a Smoky Quartz Tassel. I don’t have a favorite yet but we have sold more of the Smoky Quartz and that may be more to do with the price difference than the actual visual preference. In my estimation the BEST new products are the Twisted Bangles. What a beautiful design and now with all the added Spacers and colors of Stoppers the designs are endless! Below I have used the GREAT Lotus Top beads with the classic silver Stoppers. We are so excited each time a box comes from Trollbeads!! We are getting in such great goodies and it is getting more exciting as time draws near! As many collectors have already contacted me, it may not be news to you that the event bead we were able to have designed and created has been a smashing success! So much so we now have to set some purchasing guidelines for both purchasing at the Event and from our Wish List. It is shown below. It was brought to my attention from two different on line groups that collectors were planning on hiring shoppers to come in and buy them the Fest beads. They were offering to get them and pass them along for a higher amount to cover the cost of the shoppers. We also know that there are people who want these beads primarily to sell on a secondary marker. This is not what Event Beads were created for and I have to stand my ground with this issue. I have too many collectors who want this bead for their collection to knowingly sell it to someone hired to buy it for them. Event beads are created to celebrate the event and be a great memory of all the friendships formed through Trollbeads and through events like our Fest. 1. We are limiting each attendee to 2 Fest Beads. 2. They can be purchased only when purchased with other beads. 3. They will also not be a part of the Buy 3 Get 1 Free special. If you want more information on Trollbeads Fest! 2016please click on this link for information. It is actually on the top navigation bar on Trollbeads Gallery. On this page we have the specials listed and the hours of the event. 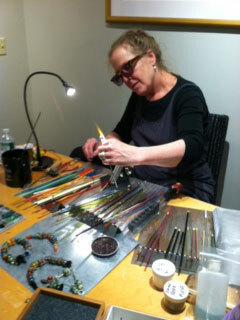 We are so thrilled to have Lise Aagaard, the founder of Trollbeads attend for the first time! She will be giving a talk on Unique Trollbeads. NEXT...Our Special Halloween Unique Bead Listings will be released on October 1st! Trollbeads Fest! 2016 Will Be The Best Yet! Now that the summer is winding down the time has come to talk about our very own “Trollbeads Fest! 2016” coming up on October 7 & 8th! Excitement is rising as our plans are falling into place! This Fest will be our 7th Annual Fest and we are incredibly excited about what we have to offer our attendees! 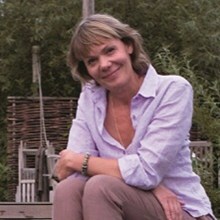 For the first time ever we will be honored by the visit of Lise Aagaard, founder of Trollbeads. Lise will be with us on Saturday for a couple of very busy hours. It is very exciting for me to host her as we have had other family members but this will be her first time at our Fest. Lise will give a talk on Unique Beads, a part of the Trollbeads collection many of us love with a passion! If you haven't had the chance to hear her speak this will be very memorable for you as she is engaging and mesmerizing when discussing glass beads! The second remarkable thing about this year is the Event Bead. In years past we have had some lovely Event beads for our Trollbeads Fest. One outstanding bead was the Fest Armadillo we had a few years back. (See image below.) Another was the Sea Blue Agate bead which was also very special. This year’s Event Bead will top them all. It all began in late spring when the Global CEO came to Mattapoisett to discuss my needs as a dealer and to offer me support. For him to come to me was an honor and during our discussion we touched on some of the recent frustrations the dealers in the U.S. have felt with U.S. Trollbeads office. The head of the U.S. office had her energies on building their retail business and not on so much on supporting the retailers. I am happy to say that this is all changing in a positive way. This year marks my 10th year as a Trollbeads dealer and Trollbeads has always understood the effort I have put into the Trollbeads brand and they wanted me to know they would do all they could to support my efforts going forward. I asked if I presented a bead design would they be willing to produce it for Trollbeads Fest. I also wanted to offer my Trollbeads Gallery Forum members the chance to purchase an event bead as a benefit of being a member. He was very positive and asked me to come up with an idea and he would discuss it with the office. I sent my idea and it was accepted. I am so grateful for the chance to offer this bead. Since the bead has had its unveiling it is my understanding that it has created quite an uproar around the world for varied reasons. One important reason is that there are many collectors around the world that can’t come to our event and are upset to miss out on this bead and I understand that. I will do all I can to help collectors that can’t make it to the Fest to have one for their collection, while supplies last. To keep up with the availability and communications on the bead please join our Trollbeads Gallery Forum! Friday October 7th, 9:30 – 5:00. Wine and Cheese reception 4:30-7:00. Saturday October 8th, 9:30 – 5:00. Lise Aagaard to be here from 1:30-3:30 to talk and for your photo opportunitues with the founder of Trollbeads! RSVP: Please let us know if you are coming. You do not need a ticket but we will be offering lunch each day and need numbers! We will also have gifts for you so knowing who will be coming is important! When we started our Trollbeads Fest it was the FIRST of its kind of event and we held it in an Event Hall in New Bedford. For 4 years we continued this tradition but we needed to charge for tickets and the lack of intimacy just didn't feel right. It was becoming too large. The first year we held it in our gallery was lovely and decided while it wasn't a major event, we preferred it as did our attendees! If you haven’t been to the Southcoast of Massachusetts you are missing and beautiful slice of America. From its beautiful harbors and great seafood to its many historical sites it is a trip worth making. Plus it will be Fall Foliage time in New England! We will be offering you a large array of unique beads, both traditional and Jumbo, many wonderful amber beads, custom Gold Beads you won't see in the line, retired Trollbeads and other hard to find beads! Did I mention the specials we are offering??? Buy 3 beads get 1 free. Receive a free $46 chain with the purchase of an upgraded clasp! Receive 2 free Silver Stoppers with a purchase of a silver or gold Bangle Bracelet. Gail Crossman Moore will be exhibiting her glass making skills once again! To read about Trollbeads Fest! 2016, click on this link to the Event Page on Trollbeads Gallery. To join Trollbeads Gallery Forum, click on this link! You will enjoy all the inspiration! Trollbeads Fest Armadillo From 2011! This beautiful bead was created by Isabel Aagaard at an event and my wish was granted for it to be our first Event bead! Below is a fond memory I share with my son Alex at an event with the Aagaards a number of years ago. I am the height challenged one and my son is next to me. It will be so nice to see Lise again. Trollbeads Continues To Wow Us! The Trollbeads Day 2016 on July 2nd brought us a beautiful Bracelet set and a gorgeous Gold Clover Bead. Well received by Trollbeads collectors around the world and it has started many new collectors on a great path to joining a dedicated community of Trollies! We have plenty of the Anniversary Bead Sets and Gold Clovers in stock! The finished Anniversay chains I have been seeing on Trollbeads Gallery Forum and on Instagram have been magnificent! 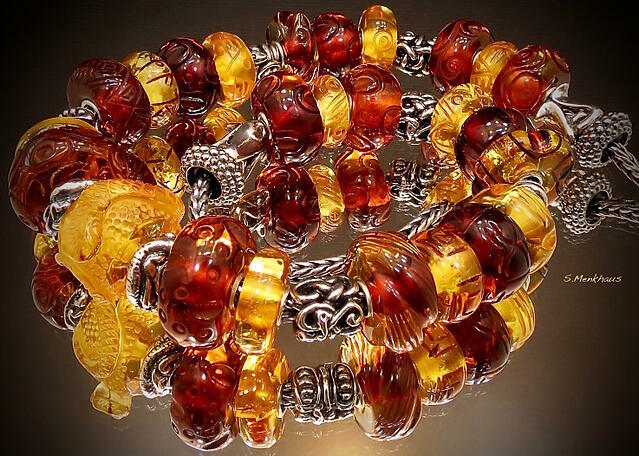 Besides the great Summer release, the Anniversary Bracelet set and Gold Clover Trollbeads has been releasing some of the best Amber they have ever produced. The Carved Amber has been sensational and hard to get! From the Snake, the Rose, Fish, the Sunburst to the little critter amber beads we have been overwhelmed by their beauty. The kits have been just as great so check out Unique Amber Bead listings when you can to catch yourself more amber beads for your collection! Below is a photo from a great collector! Thank you for sharing it with us! If you are a member of our Trollbeads Gallery Forum you get to see collector's photos like these daily! $34.00! We will be adding more information to the TBG Fest Link soon! MInus 66 days and counting! Please FOLLOW Trollbeads Gallery on Instagram!! Giuseppe de Meo from Italy, has created a colorful glass and silver bead that many will love! From Trollbeads: When designing, Giuseppe kept the idea of a rainbow of light, full of life in mind. "I designed it to bring calm and hope, and I hope that the sun will return and shine for all". It is a very timely thought. It will be on Trollbeads Gallery on September 2nd and in stores and shipped on September 9th! So many awesome things are coming our way from Trollbeads! !